Our medical director, board certified dermatologist Dr. Lorrie Klein, personally selects the highest quality, most effective esthetic services and products available. Perfect when you have more than a few blemishes. One of Dr. Klein’s favorite treatments, this 4-in-1 technology exfoliates, rejuvenates, improves acne and hydrates skin. Your skin will glow! 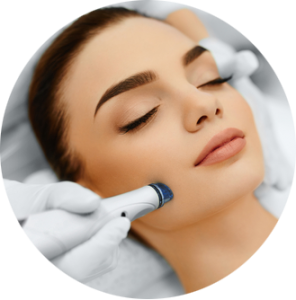 Learn more about HydraFacial MD®. These peels treat sun damage, brown spots, fine lines and wrinkles. Please make sure to arrive on time for your appointment. Treatment times will be reduced for late arrivals to accommodate our next scheduled guest on time. Appointments require a credit card or gift card number. Because your appointment is a commitment of the therapist’s time, cancellations or reschedules must be received at least 24 hours in advance. The full treatment fee will be charged to your credit card or gift card for cancellations less than 24 hours in advance and no shows. While we do not allow tipping for our medical providers, tips for our therapists are allowed and always appreciated. Please provide gratuities directly to your therapist by cash or check. Sometimes it takes multiple treatments. Purchase a package of 6 of the same facial service and receive 10% off. Purchase 12 and receive 15% off. Packages never expire. Prices effective 6/15/17. Prices subject to change without notice. Rejuvenating treatments achieve the best results when a series is performed. We offer discounts on packages to help you achieve your goals.